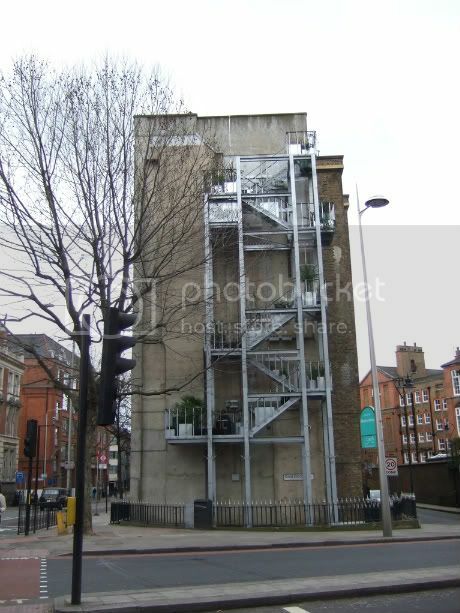 About a year ago, there was quite a bit of discussion on this site regarding the construction of the "Vertical Garden" on the end of the Devon Mansions block bordering Tower Bridge Road. Well, it's almost a year since work commenced, and I wanted to gauge people's opinions on how this has turned out. A link to the original proposal can be found here. I started the original post and have watched the thing develop over time. I my second picture of the original post you can see the wonderful tree in all it's glory. It obscures most of Metal Mickey and it's "garden". There are lots of trees like that one up and down Tower Bridge Road and Tooley Street. They add real greenery to our area - I would like to see more of them! I don't think it was worth the money. It just looks like a fancy fire escape with plants on it. I assume there are ongoing costs to keep up the plants too? I agree about the tree in front. I assume there are ongoing costs to keep up the plants too? I guess that's my biggest concern. I'd have hoped the plants were a bit more established by now, but I think some of them haven't survived the winter. I guess we'll find out when spring arrives. I'm also not sure how the plants are going to be watered during summer, given that they are so exposed. It's designed like a fire escape, but I don't think it's functional as a fire escape. No, it's definitely not a fire escape, although that's what it looks like in it's current bare state. I think the concept of an ever-changing living installation is a great one, and the Vertical Garden has the potential to be truly unique feature in south London. However I think not enough thought / care has got in the plants on the scaffolding and, as are result, they are all but invisible at the moment. Is this the best time of year to form a view on how green it looks? Perhaps someone could take a snapshot every month and post it here so we can see it change through the seasons? Well, I'll try and be charitable...the 'fire escape' look is probably the best frame for plants to take hold on and agreeing with James, lets wait until spring/summer to see how it develops. Still can't help thinking that the big wall would've made a wonderful canvas for a huge colourful mural like the one across the river at Cable Street.